This was a convenient transportation between Munich Airport and Munich Central Train Station. Finding the bus stop at Munich Airport was a little challenging, as Viator did not provide enough information on where to find the bus and the name of the bus. 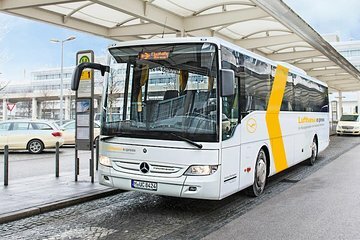 It turned out it was a Lufthansa Express Bus service between MUC and Munich Central. We like this transportation, easy and low cost, once you know where to find the bus. We realized that there is no need to book from Viator. This bus operates at regular schedule, you can go straight to the bus stop, get on the bus, pay the fee with cash, and it was a little cheaper than going through Viator. It was difficult to figure out where the bus picked us up. Once we were on it, it was worth the money as the airport was so far away from the city center. As long as you can easily find the bus and it sticks to its schedule all is good. Certainly visiting a country where I don't speak the language and having to figure out the public transportation would be more stress than I want. So if I could avoid, I would. And I did. Everything worked just as it says. Good price with good service. Our hotel was two blocks from the central train station. Inexpensive, but difficult to find the location for the bus pick up. But we found it, and it dropped us off by the railway station in the centre of Munich....possibly we would use this again, but not that easy to locate. Arranged a taxi for the return flight home. Walked out the doors of the airport and the bus stop was right there, the bus came quickly and was a comfortable ride to the train station. The driver was very courteous. This was great to use to get to Munich city. Very easy and accessible as there were signs within in the airport that directed you to where the bus was located outside. Bus runs every 15 mins with the last bus leaving Munich back to the airport around 8 pm. Very easy to locate at airport. Nice comfortable ride. Booking this transfer was a good idea. As soon as we went out of the airport the bus was there and in a few minutes it left, in less than an hour we were at the central station. Same when we went back to the airport, all went well.